Minted at officina E in Heraclea (Marmara Ereglisi, Turkey) in 297 or 298 A.D.
Sutherland, C.H.V., "Roman Imperial Coinage", Volume 6 (RIC), Heraclea, p531, nr 19b. hinterlassenen Sammlung und Aufzeichnung des Herrn Paul Gerin" (Voetter-Gerin), Heracleia, Maximianus Herculius, p112, nr 8. 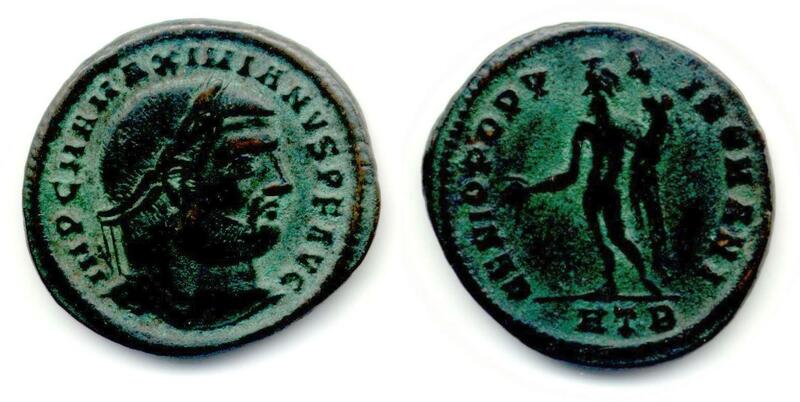 Sear, D.R., "Roman Coins and their Values" (RCV 4th Revised Edition), p309, nr. 3633, variety from Heraclea mint. Van Meter, D., "Handbook of Roman Imperial Coins", p278, nr. 39, variety with Ol/6.